I’m on a kick…florals and watercolours these days it seems. Two of my favourite things. This is another card for the 30 Day Coloring Challenge. The rose images were stamped and watercoloured with Distress Inks. Then I added a few splashes of the pink. Instead of my usual smattering of sequins I chose to add a bit of dimension and shine with some black Enamel Accents. For the 30 Day Coloring Challenge…the word today is subtle. Decided to try a very light hand with colour today. I stamped the image repeatedly to fill the card front. Next I used two different Derwent Inktense pencils to add a wee bit of colour. If you aren’t familiar with them, they are a watercolour pencil. I used a sentiment from the same set, stamped in black. Some washi and a smattering of sequins finish the card. I’ve stenciled just the bottom of the card with Finnabair’s Chicken Wire stencil and some navy ink. Next I die cut the leaves from Hero Arts…again in navy. The floral image is called French Marigold Large and it’s from STAMPlorations. It was stamped in Cobalt Archival ink and then just loosely watercolored with Distress Inks. Then it was fussy cut and popped up on some foam tape. 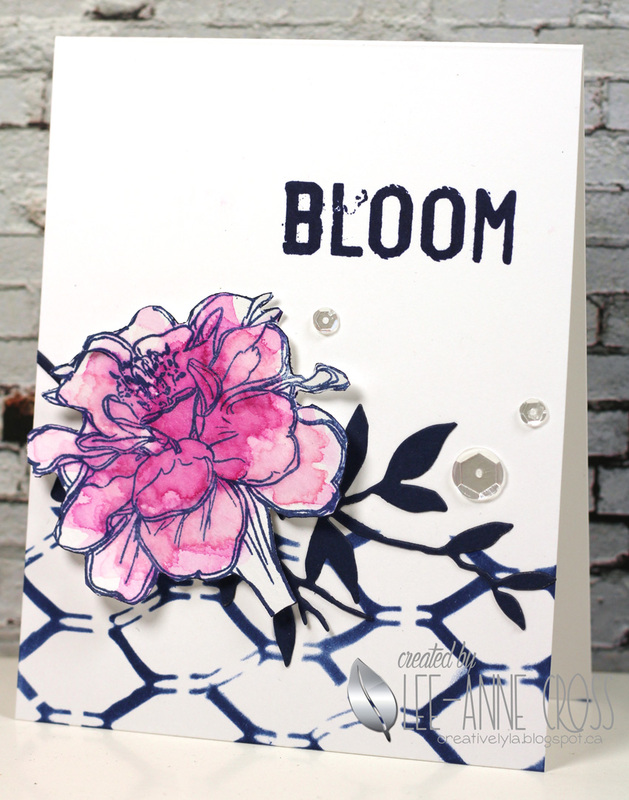 The sentiment is from STAMPlorations Hope Blooms…I love the funky curly cues around the”L”! My usual smattering of sequins and done! Hello everyone! 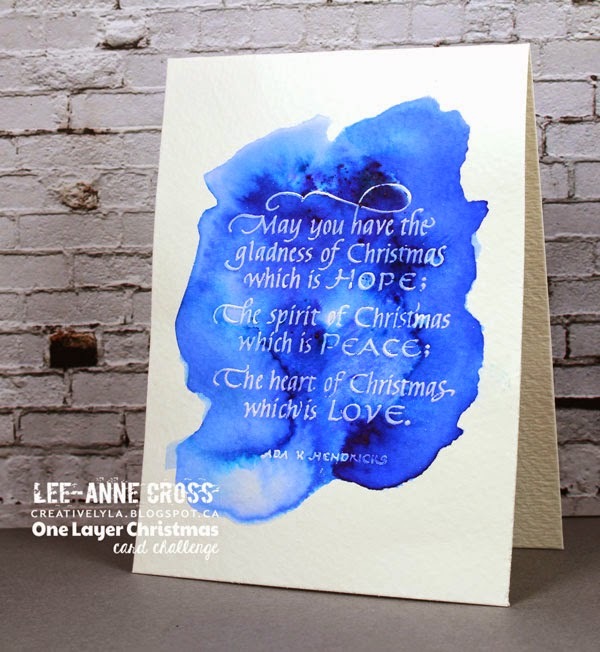 It’s time for another One Layer Christmas card challenge…I am so happy to have a start on my 2015 Christmas cards thanks to this challenge 🙂 As always, it’s an “anything goes” challenge and this time round…an optional twist of blue. Well, if you haven’t guessed by now…I LOVE watercolors and working with blue this week…well that happens to be another one of my faves! This has been made using the Kuretake Gansai watercolors and some Brushos. I cut down my watercolor card stock to 3 3/4″ x 5 1/2″ for a taller card this time. Would love for you to play along! Using the optional twist will get you an entry into the monthly random drawing. Every card that you enter with the twist = 1 entry into the drawing and you can enter as many times as you’d like! Check out the fabulous inspiration from the rest of the design team right here. 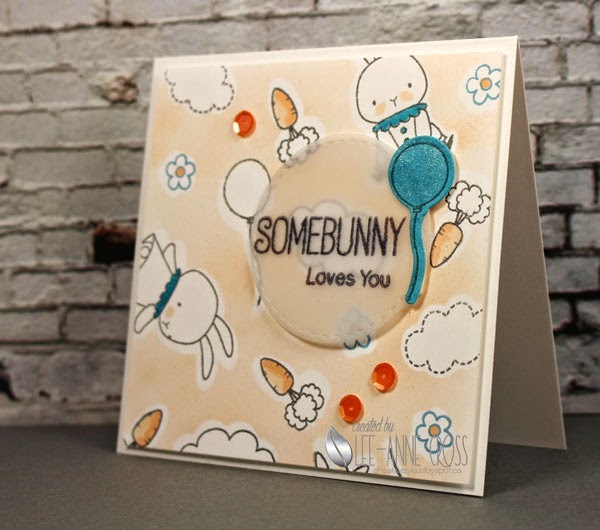 I’m back with some more homework from the Online Card Classes Stretch Your Dies class. Dawn Woleslagle from WPlus9 showed us a fabulous die technique and I finally found some time to play with it. Although, time-consuming, it’s a great technique that could work for so many matching stamp and die sets. You’ll see below that there’s no teal paper used…that’s because I used my Copic marker to color some white card stock to match the color on the bunny collars and flowers.